The European Commission said Wednesday it wants to cut emissions of carbon dioxide from cars by 30 percent by 2030, and boost the use of electric vehicles by making them cheaper and easier to charge. The proposal stops short of imposing fixed quotas for emission-free vehicles and is more modest than goals already set out by some EU members. Still, European automakers said the new targets were too drastic. Commission Vice President Maros Sefcovic insisted that the plan is the most "realistic" compromise between Europe's ambitions to blaze trails on clean energy and the costs that the continent's powerful car manufacturers will have to bear to overhaul workforces and production. 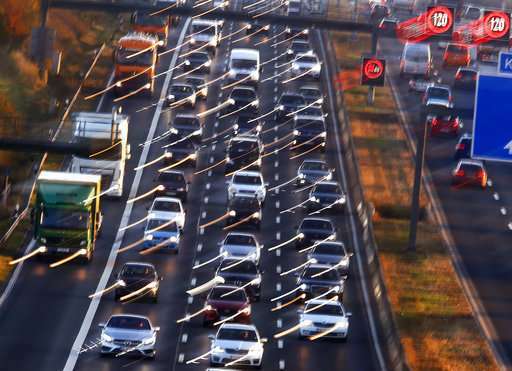 Current targets require automakers to achieve the average permitted emission for new models in the European Union of 95 grams of CO2 per kilometer for cars, or 147 grams for light commercial vehicles by 2021. The new proposal foresees a further reduction of 15 percent by 2025 and 30 percent by 2030, compared to 2021 levels. Car companies that fail to meet those targets face substantial fines of 95 euros ($110) per excess gram of carbon dioxide—per car. Automakers that manage to equip at least 30 percent of their new cars with electric or other low-emission engines by 2030 will be given credits toward their carbon tally. The European Automobile Manufacturers' Association, an industry body, criticized the 2025 target, saying "it does not leave enough time to make the necessary technical and design changes to vehicles, in particular to light commercial vehicles given their longer development and production cycles." The lobby group also said the targeted cut of 30 percent by 2030 was "overly challenging" and called for a 20 percent reduction instead, saying that was "achievable at a high, but acceptable, cost." "The current proposal is very aggressive when we consider the low and fragmented market penetration of alternatively-powered vehicles across Europe to date," the group's secretary general, Erik Jonnaert, said. The European executive's plan also includes 800 million euros in funding for the expansion and standardization of electric charging stations Europe-wide. The proposal is part of EU efforts to meet commitments under the Paris climate accord. U.N. member states are meeting in Germany from Nov. 6-17 to discuss how to implement the 2015 agreement, which called for a sharp fall in carbon emissions to curb global warming. The 2020 CO2 emission limits are already unattainable in practice, without cheating that is, so 30% less is just pure fantasy. The main issue isn't how much CO2 a car puts out of its tailpipe, but where that carbon comes from. Rather than punish consumers for the carmakers not being able to do the impossible, why not invest in means to make clean synthetic fuels to replace fossil carbon? The techology already exists, power to gas and power to liquid processes do work, and they can consume all the wind and solar power you ever want to build - the issue is slow adoption and low volumes leading to high prices, because the auto industry is being forced to go electric by these impossible CO2 demands. Still, European automakers said the new targets were too drastic. The lobby group also said the targeted cut of 30 percent by 2030 was "overly challenging"
Oh boh-ho. What a surprise. They should be glad that they are getting set such goals, because if they don't get their rears in gear they will lose the chance to stay competitive on the world's emerging markets...and will eventually be relegated to the same role as US auto manufacturers who are continually baffled why no one outside the US wants to buy their cars. By 2030 enough Greenland ice will have melted for Holland to be mostly under water. Great dithering by the EU. Still I'm sure they had some great meals on expenses and a few kickbacks while deciding on 2030.
anti, was that "rears in gear" pun intended? Unless you have a magic wand, nobody else can beat thermodynamics either. How do they then stay competitive by being forced to make smaller, less powerful and less useful vehicles than anybody else? The world's emerging markets are in need of personal mobility, and all you've got to offer them is hyper-expensive electric vehicles which they can't afford, or wheezy mopeds on four wheels. Since these "emerging markets" aren't bound by the same political buffoonery, they're likely to go the other way and solve the problem by solving the fuel source issue, and then drive as they please. Great dithering by the EU. Yeah, what I find especially crazy is that the EU demands are less than what the auto industry had set for *themselves*. But now the auto industry is claiming the EU demands are 'overly challenging'. Hypocrits, the lot of 'em. But I'm sure the managers will have golden parachutes by the time the chinese manufacturers claim this market. Go with the times or the times make you go. "the EU demands are less than what the auto industry had set for *themselves*"
Hypocrits, the lot of 'em. Regarding the CO2 proposal, ACEA welcomes the fact that the date for the new targets has been set for 2030. "This is consistent with the timings already agreed by the EU heads of states with the 2030 Climate and Energy Framework," stated ACEA Secretary General, Erik Jonnaert. However, setting an additional target already in 2025 – just a few years after the 2021 targets – does not leave enough time to make the necessary technical and design changes to vehicles, in particular to light commercial vehicles given their longer development and production cycles. Part of the problem is that the EU is forcing additional costs on the industry by shifting the goalposts every couple years, so the industry is forced to spend on retooling instead of developing better cars.